Should I re-take the GMAT? "Well? What do you think? Do I have a shot at improving my score?" Karen looked really anxious. Following a friend's recommendation, she came to see me with a typical dilemma: despite taking a long prep course at a well-known prep company and investing many months in study and practice, Karen achieved a GMAT score of 660. Although this is a high score attained by only 20% of examinees worldwide, it wouldn't have sufficed to ensure her a place on one of best MBA programs in the world. The average GMAT score of successful applicants to these programs is between 700 and 730. "Standard deviation diagram" by Mwtoews - Own work, based (in concept) on figure by Jeremy Kemp, on 2005-02-09. For many years it had been Karen's dream to do an MBA in an Ivy League b-school. She saw it as a launching pad to a successful and ambitious career which could take her anywhere in the world, and she certainly wasn't planning on giving up that dream just because of an entrance exam. Karen isn’t alone: all over the world dissatisfied examinees who hoped to attain higher scores than they did are trying to understand if they can improve their score, and if so - how? The good news for Karen and GMAT candidates like her is – yes, of course you can improve your score. 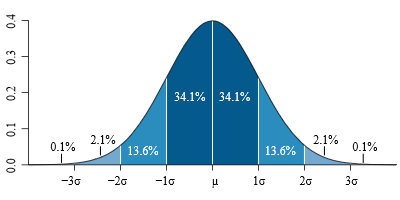 Let's begin with some statistics: According to official GMAC data (GMAC is the organization that administers the GMAT), 75% of those who sit the exam for a second time do improve their score. On average, they improve their total score by 33 points (the average improvement in the quantitative section is 2.5 points, and 2.1 in the verbal section). Having said that, the higher the score achieved the first time around, the more difficult it is to improve the second time around. The graph below shows the improvement of re-takers. As you can see, those who got a low score the first the time around (less than 500) improve by 40 points, on average, in the re-take. But those who got very high scores in the first exam (700 and over) improve by just 8 points! For examinees like Karen who got 600-690 the first time round, re-taking the test leads to an average improvement of 20 points. You can also see that the more the test is taken, the smaller the margin of improvement becomes and could even decline. And now for the really good news: with the help of a personalized study plan which focuses on identifying and improving the examinee's weaknesses, scores can be improved by 60-70 points and sometimes by more, even for those who achieved a very high score the first the time around. First, we assess the student's current situation. Does the score he or she attained in the first test accurately reflect that person's true abilities? That is to say, throughout the prep period, did the candidate get similar scores to the score achieved in the real test? Or was the test score anomalous? If it was indeed uncharacteristic, we look for a reason. For most, it comes down to a combination of stress leading to a decrease in function and concentration and improper application of time management strategies. 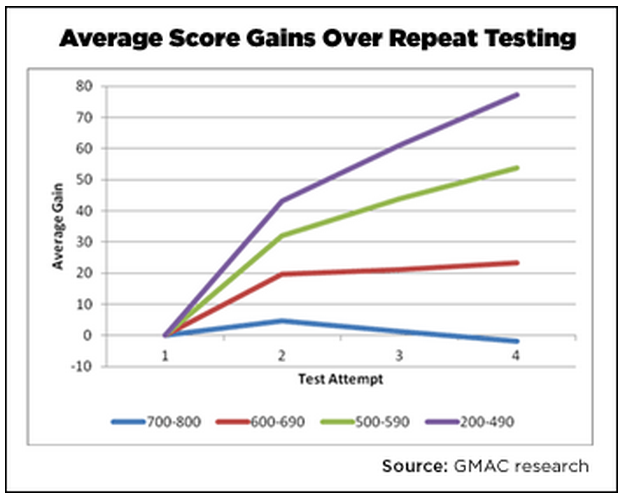 In an adaptive test like the GMAT, improper time management is likely to have a great influence on your score. This problem is relatively easy to resolve by applying correct strategies and practicing. In this way, a score can be improved by 20-30 points almost immediately and with virtually no effort. But for Karen, it was different: throughout the study period, she had been scoring 650-680, so her test score certainly couldn't be considered a surprise. In cases like these, we make a thorough assessment in order to identify problems in technique and difficulties in understanding. With Karen, we discovered that she was approaching the questions in an improper manner, using mediocre study materials and was lacking complete control in all of the topics required in order to achieve a really high score. We built her an intensive 3 week study program so that she could retake the test exactly a month after her first attempt. The program included focused work on specific topics that had been problematic for her and broader work on her general technique, as well as many practice tests. The results were dramatic: Karen achieved 730, an improvement of 70 points compared to her first test! Karen's story is typical of many GMAT candidates. A score is definitely something that can be improved, but it's necessary to carry out an in-depth assessment of the relevant problems which led to the low score and build a comprehensive study plan that properly addresses these problems. And what about Karen? She called me this week: "I've got an interview for Harvard Business School!" Doron Aaronsohn, MBA, is the CEO of Ofek GMAT, prepping students worldwide for the GMAT exam. How much will I make after I graduate? How will you know where you studies will lead you and how much you will earn later in life? 1. 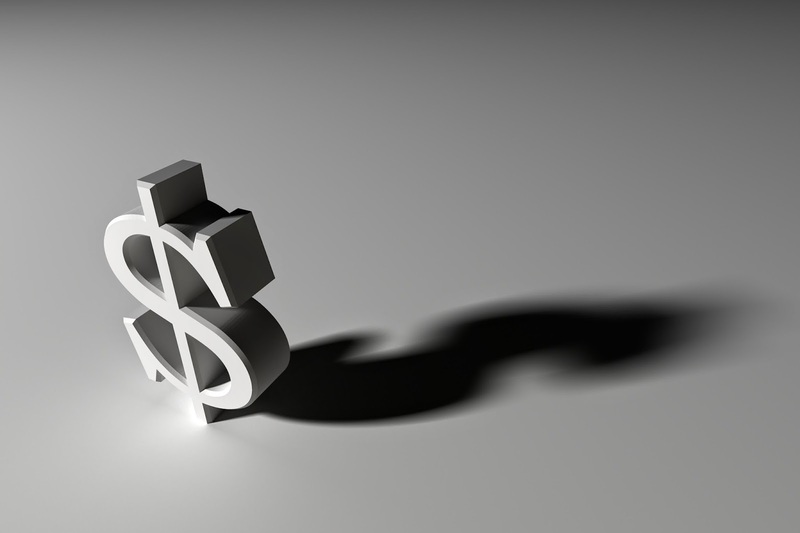 Do your research on salary levels for your field and school. There is plenty of information online regarding salaries of grads of each school, especially if it is a US school. This will give you a good general indication,. See Payscale.com or the college ROI report. 2. Do your research on percentage of employment post-graduation – understand your chances of actually finding a job after you graduate. The schools themselves and other accessible information sources are available so you can understand this factor. 3. Make a decision trying to foresee the future. One way you can do this is by consulting with a "future you" - a mentor from a background similar to yours who has been through the process and can guide you to make the right decisions. You can find people like that on the GradTrain website. Our global society definitely needs sociologists, social workers, historians etc., but when you make decisions on your field of study, you need to see how this will impact your life. If you find a job in academia and stay in the US, you may be able to sustain yourself, though if not, you may need to change careers at a later age if you cannot sustain yourself. The key is to make your decisions based on facts on just on gut feelings. 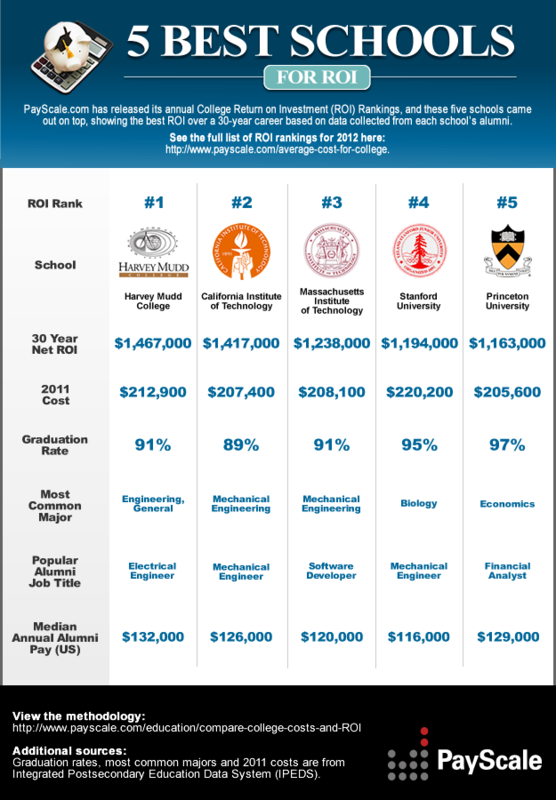 Below is an infographic regarding the 5 best schools in the United States in terms of return on investment (ROI). Wondering which country is right for you for your study abroad dreams? Take the quiz to find out which country is right for you. Let's Play!